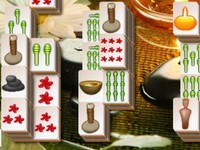 In this game: Mahjong Relax, your goal is to match identical stones and remove pairs from the field. Clear the field in each level to win the game. Game Controls: Click on the mahjong pieces.